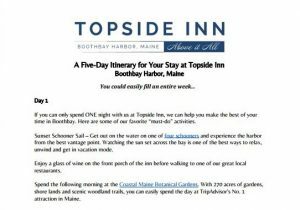 Begin your path to lasting memories in Boothbay Harbor with our free, five-day Maine vacation itinerary. Whether it’s your first visit or 20th, we can help you make the most of your time here. Let us take care of the planning so you can focus on enjoying the best that our beautiful area has to offer. Step aboard a schooner and explore the coast, see what’s in bloom at botanical gardens, and so much more. You can even discover our favorite spots for lobster rolls and local craft beers. Pick and choose your adventures or follow our guide step by step. Either way, you’re in for five incredible days in Midcoast Maine.